Stage manager Lucy Curtis works in the sound booth, following along in her script as actors run scenes in Lowe Theater. As stage manager, she organizes the show's cast, gives backstage cues and facilitates communication between director and the set crew. The musical was still two weeks away, but the logistics could not be put off to the last minute. Curtis, a senior, knows this all too well. She is the quintessential Johnnycake stage manager, having worked tech on both musicals and plays ever since she discovered her passion for it freshman year. Stage managers are responsible for verifying that blocking is marked on scripts, all cast members are present for rehearsals and that set builders understand what needs to get done. Besides preparing and working logistics for each production, stage managers work to ensure smooth rehearsals and effective communication between the cast, crew and directors. “The thing most people don’t realize is that the stage manager is the hero of every show,” said Bill McDonald, Director of Fine Arts. There is no one path to becoming a stage manager. Senior Nathaniel Crain, who served as stage manager for the January Black Box play “Red Herring,” tried acting in seventh and eighth grade but did not enjoy being the center of attention. Because he wanted to stay involved in theater, stage managing was a natural fit. “It is a good experience because it forces you to take a larger role in a production than you otherwise would,” Crain said. Crain plans to major in technical theatre and has used stage managing as a way to explore the theater community outside of school by attending Stages Repertory Theatre’s summer programs. “Theater is such an interesting form of art because it is a collaborative form, so everyone is working together to create a shared vision,” Crain said. Being a stage manager also provides students the opportunity to forge relationships with other students. Inspired by Curtis, senior Theo Sanders took on the role of assistant stage manager on “America Abridged” in 2016. “I got to be really close to the cast, and it was great to have that community,” Sanders said. Sophomore Natalie Brown relied heavily on the logistical prowess of the “Red Herring” stage crew to help her manage the transition between the different characters she played. 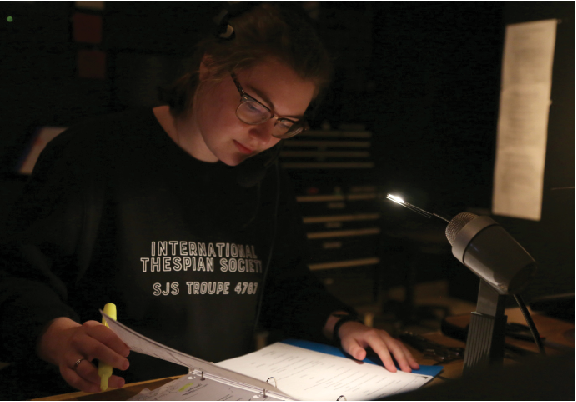 Balancing stage manager duties with academic demands is challenging, especially during the eight to nine days leading up to the final production, known as tech week. This story was originally published on The Review on March 21, 2019.